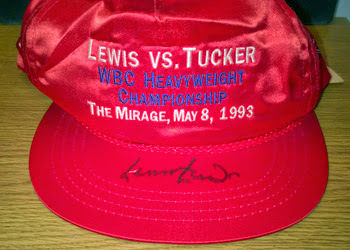 The Unique Signed Sports Memorabilia Store: LENNOX LEWIS: The Last Undisputed Heavyweight turns 49 today - Happy Birthday, Champ! LENNOX LEWIS: The Last Undisputed Heavyweight turns 49 today - Happy Birthday, Champ! Former Heavyweight Boxing Champion Lennox Lewis was born on this day in 1965 ... in West Ham, East London. But, at an early age, Lennox and his family emigrated to Canada where he grew up in Ontario and excelled at sports including Canadian Football, Football, Basketball and eventually Boxing. 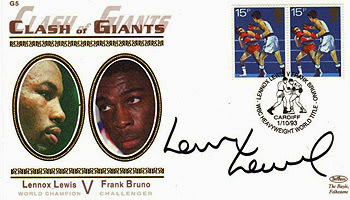 Lewis won the Super-Heavyweight gold medal at the 1988 Seoul Olympics - boxing for Canada. As an amateur, he had also won gold in the same mega-weight division at the 1986 Commonwealth Games in Edinburgh, which set him up for a stellar professional career. He returned to Britain and turned pro after his Olympic triumph having beaten another future world champ Riddick Bowe in the Olympics Final. He quickly won the European Heavyweight title in 1990, and followed this up with a win over fellow Brit Gary Mason to claim the British title. Another international belt came when he defeated another British boxer Derek Williams to take the Commonwealth title. All that was left for the boxer who had won everything was the big one - the World Title. Having seen off all fellow contenders to the world crown, he was awarded the WBC title when holder Riddick Bowe refused a rematch (after his Olympic defeat) to fight Lewis and relinquished the belt. Lewis went on to unify the World Heavyweight division and fought in some of the great bouts of modern boxing history including a record-breaking rematch with Evander Holyfield, and a demolition job of the once unbeatable 'Iron' Mike Tyson. When he finally retired from the ring in 2004, his professional record was 41 wins, 2 losses & 1 draw - with 32 wins by knock out. The self-confessed "pugilist specialist" was rated by many fight experts as the greatest pound-for-pound British boxer of all-time. I was lucky enough to see Lennox Lewis 'in the ring' just the once. Unfortunately, it was at Crystal Palace, South London in 1990 - when his opponent failed a medical test and the fight was cancelled just before the start. Lennox appeared in the ring, in a suit, to apologise to the angry crowd for the cancellation. One fan brazenly called out for his money back and Lennox swiftly offered to fight him instead - to which the fan quickly shut up and slinked away. Frank Bruno World Heavyweight title fight in Cardiff, Wales.